Way back in 2006 I subscribed to the Rachael Ray Magazine for one year – I actually wasn’t that thrilled with it – so I never renewed it. But this is one recipe from one of those issues that has stood the test of time – and I continue to make it every summer. 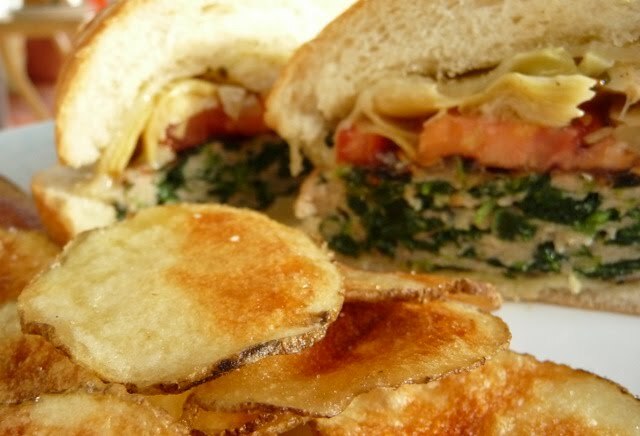 It is a burger with a mix of ground chicken and spinach and some other flavorings and topped with artichokes, tomatoes and provolone cheese. It is definitely a winner in this house. I served it with a side of microwave potato chips – have you tried these yet? If not – you are missing out! 1. Preheat a grill, grill pan or large nonstick skillet to medium-high. If using a grill pan or skillet, preheat the broiler. 2. Place the ground chicken in a medium bowl and season with salt and pepper. Add the lemon zest, Parmigiano-Reggiano, minced garlic, spinach, thyme and a drizzle of EVOO, about 2 tablespoons, and combine. 3. Form into 4 patties and cook the burgers until firm and cooked through, about 6 minutes on each side. 4. Toast the rolls either on the grill or broiler. 5. 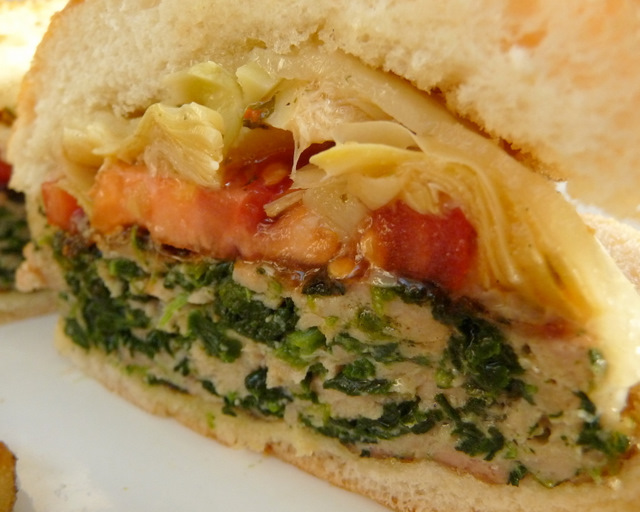 In the last 2 minutes of the burgers’ cooking time, divide the tomato slices and sliced artichokes evenly among the burgers, then cover each with a slice of provolone. If cooking on the grill, drop the lid to melt the cheese. If cooking on the stovetop, tent your grill pan or skillet with aluminum foil. 6. Place on rolls and serve. Looks good, I love anything with spinach and artichoke's! I'm always on the hunt for ways to spice up the typical burger or turkey burger--can't wait to try this!